April 12 at 6:54 p.m.
April 12 at 12:41 p.m.
April 11 at 6:31 p.m.
March 22 at 2:23 p.m. The production company and long-time agent for radio “shock jock” Howard Stern has sued Sirius XM Radio Inc. in the New York Supreme Court, alleging Stern was promised performance-based stock awards the satellite radio company refused to pay. March 22 at 2:17 p.m.
From Bloomberg News | A Bankruptcy Court judge ruled Tuesday that creditors can file state suits against former Tribune Co. shareholders who netted billions of dollars when the media company was taken private in 2007. Federal lawsuits are under way on the matter. The company filed for Chapter 11 in 2008. March 15 at 10:19 a.m.
Tower Ticker | WLS-AM 890 has found another husband-and-wife team to fill in Wednesday morning for Don and Roma Wade: Former reality TV stars Rod and Patti Blagojevich. March 14 at 2:31 p.m. 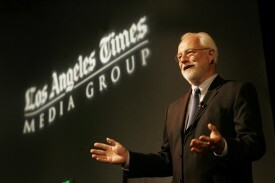 The publisher and CEO of the Los Angeles Times says it’s important that the Tribune Co. emerge from bankruptcy protection as soon as possible. Eddy Hartenstein, also a co-president of Tribune Co., testified Monday that the cloud of bankruptcy is hurting Tribune’s ability to keep and attract employees and to forge partnerships to help it compete in the rapidly-changing media industry. March 10 at 1:21 p.m.
Everyone, it seems, has a price and Cumulus Media finally found Citadel Broadcasting’s. Cumulus said Thursday it has agreed to acquire Citadel, parent of Chicago’s WLS-AM and FM, in a cash-and-stock transaction that values Citadel at between $2.4 billion and $2.5 billion. March 10 at 10:53 a.m.
Tower Ticker | Eddie and Jobo are back with CBS Radio in Chicago, and Jack’s been jilted. If it’s not quite like old times at WJMK-FM 104.3, it will be closer than it has been. Beginning at 1:04 p.m. Monday, the one-time oldies station will switch from the Jack FM variety format it’s embraced for almost six years to a mix of hits from the 1960s, ’70s and ’80s. Gone will be the disembodied recorded voice of Jack (Howard Cogan), replaced by actual live and local on-air personalities. Rebranded as K-Hits, though the call letters won’t change, WJMK will also bring the long-time team of Ed Volkman and Joe “Jobo” Bohannon (nee Colborn) back not only to morning radio as 5:30 a.m. to 10 a.m. weekday hosts but also to CBS Radio, which cut them loose from WBBM-FM 96.3 in late 2008 with many months left on their multimillion-dollar contracts. March 7 at 6:31 p.m.
Feb. 15 at 3:54 p.m.
Bloomberg News | The Robert R. McCormick Foundation, onetime one of the largest shareholders in Tribune Co., opposes the remaining two reorganization plans for the media giant, because neither would end lawsuits against shareholders, including the foundation, that made billions of dollars in the company’s leveraged buyout. Jan. 27 at 5:24 p.m.
Zell tells Forbes he won’t miss Tribune Co.
Tower Ticker | The same day Tribune Co. reported an uptick in its business during 2010, Forbes Magazine posted an interview with Chairman Sam Zell in which the entrepreneur once more made it clear he won’t be sorry to say farewell to the Chicago-based media concern. Jan. 26 at 12:44 p.m.
Chicago-based Tribune Co. said Wednesday that operating cash flow at its two largest publishing units — the Los Angeles Times and Chicago Tribune — was essentially flat in 2010 compared to 2009, while overall operating cash flow increased $140 million to $635 million. Jan. 24 at 12:43 p.m.